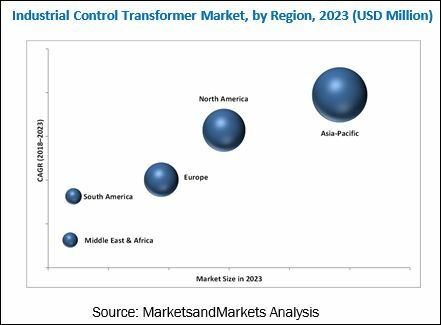 [127 Pages Report] The global industrial control transformer market reached USD 777.7 Million in 2017. It is projected to reach USD 1.04 Billion by 2023, growing at a CAGR of 5.14% from 2018 to 2023. Booming power sector and augmented power generation capacities worldwide, need to reduce equipment failure caused by frequent voltage spikes, and increased usage of industrial control transformer across major industries are driving the market across the world. The industrial control transformer market is segmented on the basis of phase, power rating, end-user, and region. This research study involved the use of extensive secondary sources, directories, and databases, such as D&B, Bloomberg Businessweek, and Factiva, to identify and collect information useful for a technical, market-oriented, and commercial study of the industrial control transformer market. Primary sources are mainly industry experts from the core and related industries, preferred suppliers, manufacturers, distributors, service providers, technology developers, standard and certification organizations of companies, and organizations related to all the segments of this industry’s value chain. The points given below explain the research methodology. Some of the leading global manufacturers of industrial control transformers are ABB (Switzerland), Siemens (Germany), Eaton (Ireland), Schneider (France), GE (US), Hubbell (US), Emerson (US), and Rockwell (US). 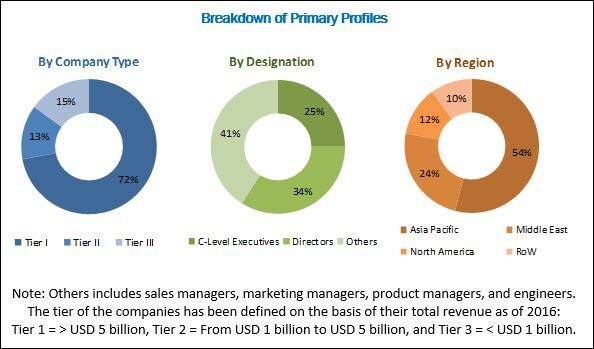 The global industrial control transformer market is estimated to grow from USD 809.2 Million in 2018 to USD 1039.8 Million by 2023, at a CAGR of 5.14% during the forecast period. Booming power sector and augmented power generation capacities worldwide, need to reduce equipment failure caused by frequent voltage spikes, and increased usage of industrial control transformer across major industries are driving the market across the world. In this report, the industrial control transformer market is segmented on the basis of phase into single and three. The three-phase segment dominated the market owing to better efficiency in industrial applications. Three-phase industrial compressors are used to drive a variety of general machinery such as compressors, pumps, crushers, cutting machine tools, and other mechanical equipment in petroleum, chemical, power plants, and other industrial and mining industries. The industrial control transformer is further segmented on the basis of power rating into 25-500 VA, 500-1,000 VA, 1,000-1,500 VA, and above 1,500 VA. The above 1,500 VA segment dominated the industrial control transformer market. This segment is driven by a large number of installation in heavy industries such as oil & gas, metal & mining and power generation. Based on end-user, the market has been segmented into power generation, oil & gas, chemical, metal & mining, and others. The metal & mining segment dominated the industrial control transformer market owing to increased expansion in industrialization, construction, and infrastructure activities. The industrial control transformer market is analyzed with respect to five regions, namely, North America, Europe, Asia Pacific, South America, and the Middle East & Africa. Asia Pacific dominated the market. The market in Asia Pacific is expected to hold the largest share of the global market till 2023. Need to reduce equipment failure caused by frequent voltage spikes are driving the market in Asia Pacific. The major factor restraining the growth of the industrial control transformer market is the stagnant growth in oil & gas industry and a slowdown in the mining industry in Asia Pacific, South America, and Africa. The industrial control transformer industry is very fragmented and offers opportunities for consolidation. This can be seen by the several major mergers & acquisitions taking place in the industry. In this industry, most players are global multinational companies. Some of the leading players in the industrial control transformer market include ABB (Switzerland), Siemens (Germany), Eaton (Ireland), Schneider (France), GE (US), Hubbell (US), Emerson (US), and Rockwell (US). These players have adopted growth strategies such as new product launches, mergers & acquisitions, and expansions & investments to capture a larger share in the market. 11.12 Dongan Electric Manufacturing Co.